Dr. Ibanez is a Cardiologist and is part of a multidisciplinary research team with a special focus in Cardiovascular Imaging at Mount Sinai School of Medicine, New York, NY. He received his MD in 1993 from The Universidad Complutense de Madrid in Madrid, Spain. He performed his Residency and Fellowship in Cardiology at Fundacion Jimenez Diaz, Madrid, Spain. He received several honors and awards from the Spanish Society of Cardiology. He has published a number of articles and has received Young Investigator award nominations at the European Society of Cardiology Annual meeting in 2007 and the North American Society for Cardiac Imaging in 2005. The assessment of changes in atherosclerotic plaque volume is increasingly used as a surrogate endpoint in clinical trials evaluating the effects of antiatherogenic therapies. Currently, intravascular ultrasound, cardiovascular magnetic resonance, and carotid intima media thickening are the modalities usually used. The utility of multidetector computed tomography (MDCT) for this purpose has not yet been assessed. This article presents the results of a pilot study in rabbits to evaluate the use of MDCT to monitor changes in atheroma volume. Methods: Abdominal-aorta atherosclerotic lesions were induced in rabbits (n = 7), which were then randomized to 2 doses of placebo or a drug with known plaque-regressing properties (apoA-IMilano). Pre- and posttreatment 64-slice CT angiographic studies of the aorta were performed. Results: Plaque burden by MDCT regressed by 29% in apoA-IMilano-treated animals while it did not significantly change in the placebo group. In the last MDCT study, plaque volume was 10.6% smaller in apoA-IMilano animals, which corresponded to the postmortem histologic analysis (11.5% smaller plaque in the apoA-IMilano group). Conclusion: Multidetector CT is a promising tool to assess changes in atheroma burden. Atherothrombosis is the major cause of morbidity and mortality worldwide. Atherosclerosis is characterized by lipid deposition (along with other inflammatory material) within the arterial wall, leading to plaque formation. At the early stages of atherogenesis, the lumen of the vessel is not affected because of the "positive remodeling" of the external elastic membrane and eccentric plaque growth; therefore, the luminogram of the atherosclerotic vessel may appear to be "normal." Hence, imaging modalities that are capable of accurately visualizing the entire vessel wall have gained enormous interest in order to quantify the atherosclerotic burden. The aim of this study was to assess whether MDCT is able to detect and quantify the changes in the atheroma burden of the abdominal aorta that are associated with the administration of apoA-IM in an established animal model of atherosclerosis. The study protocol was approved by an institutional animal research committee, and all animals received humane care in compliance with the "Guide for the Care and Use of Laboratory Animals." The MDCT images were transferred to a dedicated workstation for analysis. The 17 consecutive 3-mm slices immediately distal to the left renal artery were prespecified as the area of study for the pre- and posttreatment MDCT studies. Because plaque visualization is affected by the attenuation of the lumen, 15,16 a region of interest (2 to 2.5 cm 2 ) was placed in the center of the vessel in each of the slices, and the average attenuation was recorded. The mean luminal attenuation in each study was calculated by averaging the values of the 17 individual slices. Afterward, the display settings were manipulated as follows: for lumen quantification, the window level was brought to 65% of the mean luminal attenuation, and the window width was reduced to 1. For detecting outer vessel boundaries, the window level was kept unchanged, and the window width was brought to 155% of the mean luminal attenuation. These settings were chosen because they have been shown to represent the optimal values for plaque-size measurement when compared with coronary IVUS examinations. 8,17,18 This combination generates a "black and white" image for the detection of the lumen area and a discernible outer border of the vessel wall depiction (Figure 1). Each of the 17 axial sections were manually traced by 2 independent researchers who were blinded to the time of the study and to the treatment arm. Plaque volume of the individual segments was calculated as the difference between total vessel volume (3 × vessel area) and lumen volume (3 × lumen area). The primary endpoint of the study was the change in plaque burden be-tween the initial and final MDCT studies. Plaque burden was quantified as the total plaque volume, calculated by adding the plaque volumes of each of the individual slices within the aortic segment of interest. In addition, total lumen volume (the sum of individual slice lumen volumes) and total vessel volume (the sum of individual slice vessel volumes) were computed. A secondary analysis included the change in the individual (slice) plaque volumes. For this comparison, pre- and posttreatment images were matched by its distance from the left renal artery. An observer who was blinded to the treatment arm performed the immunohistochemical analysis using a computer-based validated semiautomatic quanti-fication method programmed on ImageJ (National Institutes of Health, Bethesda, MD) and determined the plaque area (vessel area-lumen area). Continuous variables are expressed as the mean ± standard error of the mean (SEM). Statistical comparisons of means were made by Wilcoxon Signed Rank test. A value of P <0.05 (2-tailed) was considered statistically significant. All statistical analyses were performed with the statistical software package SPSS 11.0 (SPSS Inc., Chicago, IL). Contrast-enhanced 64-slice MDCT angiography was performed successfully in all animals, resulting in adequate image quality for analysis. Figure 2 shows the results of the primary analysis of the study. A statistical significant plaque burden regression (-29%, P = 0.031) was observed in the apoA-IM group between pre- and posttreatment MDCT studies, while no significant change was observed in the placebo animals. 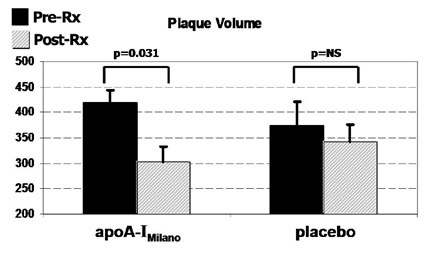 A nonsignificant reduction in total lumen volume was observed in the apoA-IM group, while no effect was found in the placebo group (Figure 3A). A change in the total vessel volume showed a strong trend toward external elastic membrane shrinkage in the apoA-IM group (20% regression versus pretreatment MDCT, P = 0.1), whereas no change was documented in the placebo group (Figure 3B). Figure 4 illustrates individual changes in total plaque burden. At the slice level, changes in plaque size followed a comparable pattern. 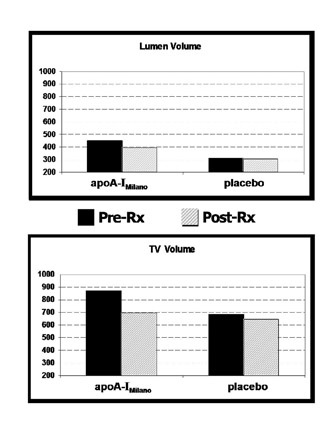 The mean segmental plaque volume regressed in the apoA-IM group (-28% versus pretreatment MDCT, P = 0.03), whereas no change was observed in the placebo group (Figure 5). Overall, there was good agreement between the final MSCT study and the histological analysis. In the posttreatment MDCT, the plaque burden of the apoA-IM-treated animals was 11.5% smaller compared with that of the animals that received placebo, although this comparison did not reach statistical significance. 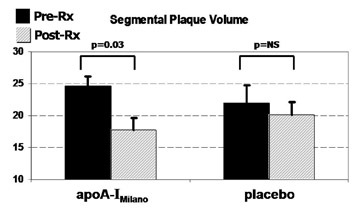 At the slice level, the mean plaque volume of the apoA-IM animals was 11.5% smaller than that of placebo animals ( P = 0.018). In the histologic analysis, the mean plaque area was 10.6% smaller in the apoA-IM group ( P = 0.005). In the current study, the hypothesis that MDCT is able to assess changes in atheroma burden has been tested. Abdominal aorta atherosclerotic lesions were induced in a well-established research model of atherosclerosis. 13 All animals underwent 2 imaging studies, and, thus, every animal served as its own control. Plaque burden was significantly reduced in animals receiving apoA-IM, while nonsignificant changes were seen in the placebo animals. Change in plaque volume is currently one of the major surrogate endpoints used in clinical trials. The advent of new imaging modalities made it possible to accurately monitor changes in plaque volume, while before only the vessel lumen was quantifiable. Such imaging modalities include IVUS, CMR, and carotid IMT. All these imaging modalities have certain issues that limit their global acceptance. Intravascular ultrasound can accurately depict coronary atheroma, and it has been shown to reliably monitor changes in atheroma burden; however, its invasive nature makes its use limited. Cardiovascular MR is an extremely accurate tool to quantify and monitor changes in atheroma burden, but currently the coronary territory is not well depicted because of its limited temporal resolution. Carotid IMT is a noninvasive, safe, and reproducible imaging modality that can precisely examine changes in wall thickness. However, its usage is limited to the carotid region, and the type of lesions developed in that area are widely different from those in the coronary and aortic arteries. Multidetector CT is a noninvasive new modality that potentially can overtake all limitations stated above. In fact, few studies have reported the accuracy of MDCT in quantifying the atherosclerotic plaque burden. Those studies validated the MDCT analysis with well-established imaging modalities: IVUS or CMR. 10,13,17 However, so far, there is no data on the value of MDCT to monitor changes in atheroma burden. To the best of our knowledge, this is the first report showing serial imaging studies for the quantification of the atheroma burden. Currently, there are several lipid-altering interventions that have been proven to regress plaque burden; however, the time needed to achieve this effect is very long. 1,3,19 ApoA-IM is a mutant form of apoA-I that has been shown to significantly regress atheroma volume in all the animal studies so far reported. 20-22 It has also been tested in humans, showing a significant coronary plaque regression in just 5 weeks. 23 We have recently reported, using the same atherosclerosis model as described here, that only 2 infusions of apoA-IM in 4 days induced a significant reduction in abdominal aorta plaque volume, as assessed by CMR. 11 Due to its unequivocally known rapid plaque regressing effects, apoA-IM represents the ideal tool to explore the utility of MDCT to monitor changes in plaque burden. Usually, the effect of a new intervention is assessed with an established imaging modality; here, we have done it the other way around: using a drug with known plaque-regressing effects, we have tested the feasibility of using MDCT to monitor changes in plaque burden. Since plaque visualization is affected by the attenuation of the lumen, 15,16 we decided to use a display setting that takes this parameter into account. However, at this point we cannot be sure that the vessel wall measurements could have been randomly affected by this parameter. In an animal model of atherosclerosis, the administration of apoA-IM (a drug with known rapid atheroma-regressing effects) was used to explore MDCT utility to monitor changes in atheroma burden. Atheroma burden in animals receiving apoA-IM was 30% significantly smaller in the posttreatment MDCT study compared with the pretreatment study. Placebo administration resulted in no effect on plaque burden. Posttreatment plaque burden in apoA-IM animals was 10.6% significantly smaller than in those treated with placebo, in agreement with the 11.5% significant smaller plaques found in histology. These results suggest that MDCT may serve as a tool to explore serial changes in plaque volume. The author is indebted to the mentorship from Drs. Juan J. Badimon, Mario J. Garcia, and Valentin Fuster. In addition, the great work by Drs. Javier Sanz and Susanna Prat-González, which was crucial for the proper study design and performance, should be acknowledged. Drs. Carlos G. Santos-Gallego and Juan Benezet-Mazuecos significantly contributed to the performance and analysis of the data. Finally, the author would like to thank Dr. Badimon's laboratory at Mount Sinai School of Medicine for all the help and support. The drug administered to the animals (apoA-IMilano, ETC-216) was provided by Pfizer Research and Development, USA. 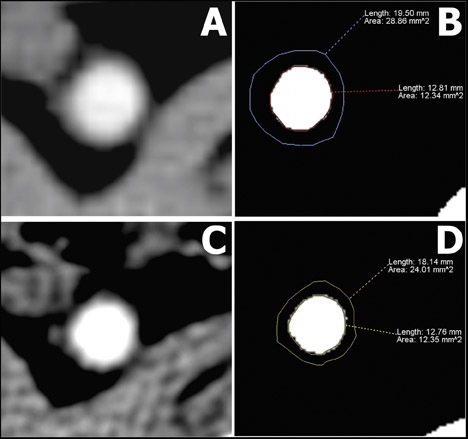 Utility of 64-slice CT to monitor changes in atheroma volume: A pilot study. Appl Radiol.